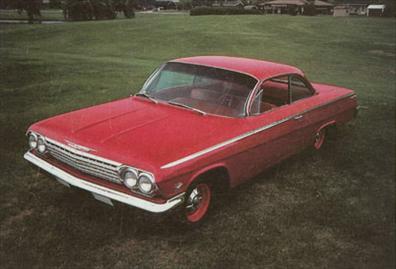 Cheaper and lighter impala was chevys most popular series, but bel air had the advantage of being cheaper and for higher speed 100 lbs. Lighter. In addition to the bel air coupe in 1962, there were two sedans and two station wagons. The standard engines for the series were a 235.5-cu.-in. Six-cylinder and a 238-cu.-in. V8. one horse per cubic inch the 409-cu.-in. Engine had such improvements as aluminum pistons, stronger valve springs, a higher-lift camshaft and a compression ratio raised to 11:25.1. Other features included an aluminum manifold with a four-barrel carter afb carburetor on top for the 380hp version. The 409hp version (one hp for each cu. In.) had twin carbs and a special lightweight valvetrain. A total of 15,019 409 engines were used in 1962 chevys. The 1962 chevy bel air became aperformance car when the sports coupe or two-door sedan was equipped with a 409-cu;-in. V8 engine.